DANCE INSTRUCTION – Feel the beat. Find your rhythm. A barefoot aerobics movement/dance class accompanied by live drumming! 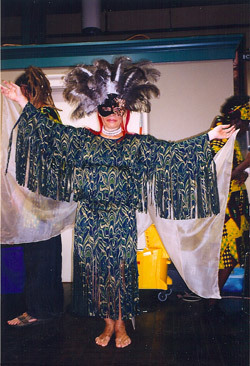 West African rhythms provide fitness and fun for everyone. Guaranteed movement for your body, heart and soul. Class is appropriate for all levels of fitness and ages. Come with a willingness to laugh, sweat and get in touch with your personal rhythmic movement style.